Appliance service you can count on! Refrigerators, freezers, icemakers, dishwashers, microwaves, and garbage disposals all play a part in our daily lives. One of the worst things that can happen is to be in the middle of a busy week and have one of your appliances stop functioning properly. It can be stressful and can really slow down your day. Luckily, Apex Appliance Service is here for you. We are the appliance service expert; if you need anything from a local refrigerator repairman to a luxury appliance, we’ve got you covered. 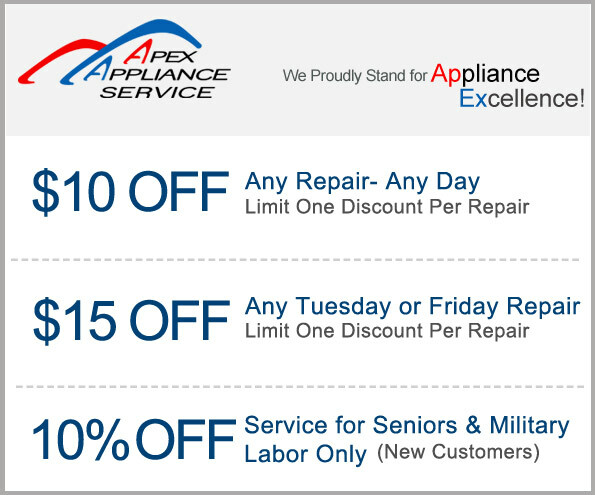 At Apex Appliance Service, we’ve increased education and training programs, so we can perform any and all types of repairs from hi-end appliance repair to small appliance repair. We have advanced knowledge of mechanical, electrical, and electronic aspects of all appliances. Whether it’s a kitchen appliance repair or another issue, our team will combine our vast knowledge, experience, and skills to take care of it. Our state licensed technicians always arrive on time. They’re friendly, knowledgeable, respectful, and reliable. They’ll be able to give you an honest estimate and complete the job for that estimate. No hidden costs or fees. After a job well done, they will be able to provide you with the new life expectancy of your appliance. They’ll also be able to educate you in regards to preventative measures and maintenance tips. We believe that when we have completed this checklist and properly repaired your appliance, you’ll be completely satisfied. Your heavily relied upon appliance will be back up and running, and your life will return to normal. No more stress, worries, or burdens. If you’re located in San Diego County and one of your appliances breaks down or isn’t working properly, give us a call today at (800) 603-5543. We will have you back up and running in no time.